So I'm still familiarising myself with the blogging world, having been too busy recently to write anything aside from financial reports or proposals, it's rather daunting writing on a public platform . I thought I would start blogging by showing a pic of one of my favourite shopping spots- Selfridges London. The moment I entered was faced with the hustle and bustle of London December sale shopping, I felt like I was home!!! The beautiful clothes, people, jewellery kiosks, beauty departments and the food hall! Absolutely divine! Whilst I believe in good shopping, and finding value for money, the items I acquired were classic pieces which would be a basic for any fashionistas closet. The experience is one not found in any of our department stores and I am hopeful we will have it soon... Although, locally one can have an awesome experience at Zara, Stuttafords, Forever New and more recently some nicely decked out Mr Price stores . 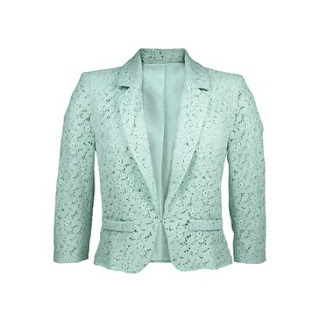 For now, my must item that I am craving and dying to find the, mint lace blazer, incorporating all the trends- the pastel colour in lace! I'm loving it!